The Ghost is a lo-fi creepy, sludgy mess of a delay. Don’t be deceived by its small size. Its hauntingly musical echo could fill the halls of a cavernous cathedral. Ghosts I and II give you a range of eerie, oscillating repeats in a small box. The echo and dwell controls are interactive. With dwell at zero and echo at max, you get clean repeats that are ideal for slap back. Keeping echo at zero and turning the dwell up sends filtered repeats continuously back to the input of the circuit. After the dwell knob exceeds the midpoint, the delay cascades into a cacophony of oscillating madness. With dwell and time both set at their midpoints, you’ll get ambient and dark repeats. It’s possible to achieve nearly infinite, non-oscillating repeats at roughly the midpoints of the dwell and echo controls. Setting the dwell beyond the midpoint brings in the typical runaway oscillation of other delays. Mix the controls to produce a decent range of interactive tone shaping on the repeats. The Ghost II differs from the original Ghost in that it is in a slightly larger enclosure but with some added benefits. We’ve added a momentary slam switch that sends the Ghost II screaming into the netherworld. But if the dwell and echo controls are dialed in just right the oscillation will fade in more slowly giving an eerie effect to the ends of songs, or dramatic pauses. 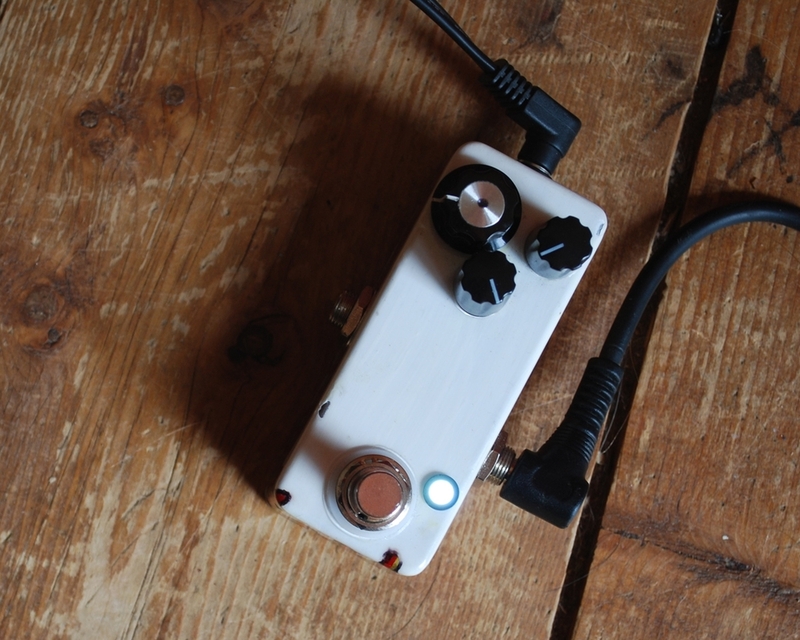 Momentary Switch (Ghost II) : The stomp switch on the left maximizes the dwell knob sending the delay into oscillation. Toggle Switch (Ghost II, on some models) : Flip the switch up for brighter sounding delays and down for moody, dark delays. Watch a short video clip to hear the haunting echo of The Ghost. A video comparing ghost and ghost II will be coming soon. All pedals are hand painted by our artists. Each unit is a total one of a kind. Get your own for $140-160.